I have a first grader in the house now. I’m glad we don’t have to do that questionnaire anymore, because I’m pretty sure I’d come to the realization my boy is out of the house more than he’s in it during his waking hours, and I’m not sure I’m ready for that. 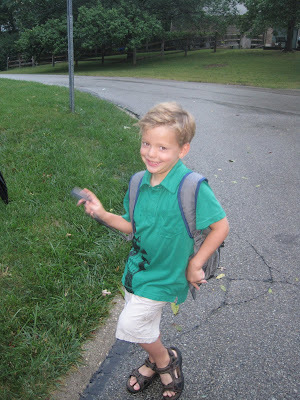 O.’s first day of first grade seemed to go well. That is, after we finally got him there. His bus was twenty-five minutes late. Since we were supposed to be at the bus stop ten minutes early just in case, that meant 35 minutes of our entire family hanging out at the bus stop, peering down the street every 30 seconds or so to see if we might be catching a glimpse of the big cheese. 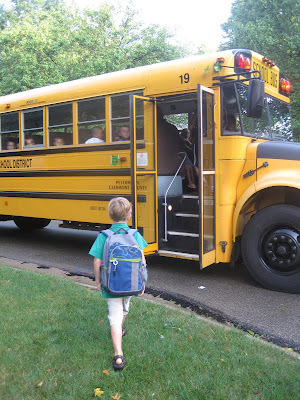 Finally, bus number 19 arrived (seems there was an accident slowing traffic all around our neighborhood) ten minutes after the school day was supposed to start. O. reported no issues with the late arrival, and made it to his classroom as he was supposed to. He got off the bus in the afternoon with a recess war wound (bandaged finger, that I later realized was a much larger and bloodier cut than I had first observed. Trip to the nurse and everything!) and stories mostly about lunch and the friends he reconnected with. I think today was mostly about learning the rules and routines. His new teacher uses different bells and instruments to signal transitions. Instead of filling up a paper gumball machine with gumballs for good behavior, this year they’re filling up a bowl with dog biscuits. They went to music, but just learned about rules. When he came home, he wanted to watch the DVD his sister picked out at the library for him. I told him I wasn’t sure I wanted us to get in the habit of him watching TV every day right after school. Little Miss N. and Little Mr. L. were okay while he was gone, seemed to at first enjoy a little independent time with Mom while he was gone, but by the time it was time to head to the bus stop again, N. was at loose ends. 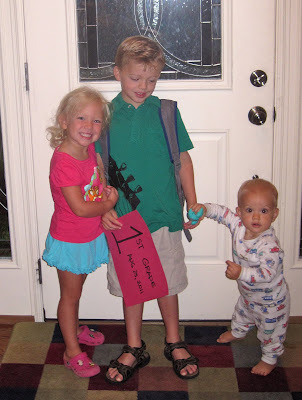 We blew up balloons and made a sign that said “Happy First Day of First Grade” posted it to the front door, and made a plan to yell “Happy First Day of School” as soon as he got off the bus. The two of them are such buddies. By evening, N. was wild, running and chasing O. around the house, so clearly full of joy to have him back in her realm. It makes me sad to think that L. won’t remember the long days that all three of them spent together, rolling around the family room. I hadn’t thought about how potentially wide the space could be between these brothers with such different experiences each school day. It will be such a long time before L. joins them on the bus. O. was body checking L. in the basement before dinner, knocking him down with a slide tackle. L. just kept coming back for more, crowing with delight the whole time. And that, I’m pretty sure is how it’s going to be for life. So far, a pretty good start to the year. I’m sure we’ve got exhaustion and frustration and resistance to getting up in the morning in our very near future, but for now, it’s nice to bask in the glow of the carefully combed, freshly scrubbed face of the first day of school. Will N remember the long days at home with big bro O? Will you and I remember the long days at home with one and two and three little ones? But how well? Bub would be so excited about the dog biscuit reward system. Too bad his involves apples and worms, though he seems to like that. Love all the photos, especially L's pose in the group shot! Love these pics! And even if they don't remember those days, they can always look at this blog and relive it through your words and pictures...after all, that's part of why we do this, right?